Veteran goalkeeper Paul Bastock has returned to Kettering Town - 26 years on from his last appearance for the club. The 47-year-old stopper, who started this season at Corby Town, has been brought in at Latimer Park to act as cover for first-team goalkeeper Paul White for the run-in in the Evo-Stik South League Premier. Bastock made history this season when he overtook Peter Shilton's world record for appearances by a goalkeeper and had most recently been with United Counties League Premier Division title challengers Wisbech Town. Bastock's first spell with the Poppies was back in the early 1990s as he made 38 appearances for the club, including the 4-1 defeat at Blackburn Rovers in the third round of the FA Cup in January 1992. 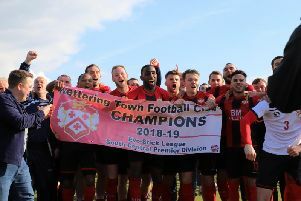 Kettering are currently challenging for a play-off places and will be looking to follow up their 4-0 victory at Stratford Town on Saturday when they entertain Royston Town at Latimer Park tomorrow (Tuesday) night.